Every year, many Singaporeans get sick because of food poisoning and other food-related illnesses. It is difficult to battle it since harmful contaminants are invisible – it cannot be seen, tasted, touched or even smelled. The single most thing that you can do is to ensure that the internal cooking temperature parameter is observed. Foods should meet internal temperature to ensure that it can be consumed safely. Knowing this, you have to protect the family against food poisoning using a food thermometer. 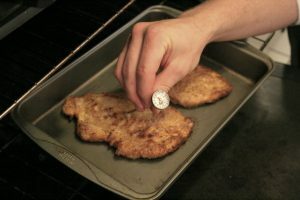 Food thermometer can help you determine whether the cooked food reached its safe cooking temperature. Food thermometers are readily available here so you won’t have a hard time looking for it. Using it is pretty simply, you just need to pierce it through the cooked meat, seafood or poultry after the cooking time (make sure to remove it from the fire). If it did not reach a specific temperature, it means it needs more cooking and heating. Make sure to choose digital food thermometers since their readings are more accurate than others. Meat: The temperature will depend on the doneness. For example, the temperature of the medium rare beef should be 63°C or about 145°F. The medium beef is 71°C or 160°F while the well done beef should be at least 77°C or about 170°F. For pork products like pork loin, ham and ribs, the temperature should be at least 71°C or 160°C. 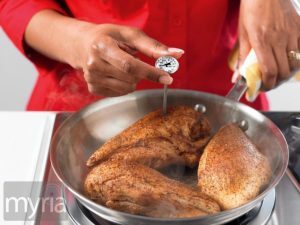 Poultry: For poultry products like chicken, duck and turkey, the temperature should be at least 74°C or 165°F for pieces and 82°C or 180°F for whole. For egg dishes, the temperature should be at least 74°C or 165°F. Seafood: Fishes should be at least 70°C or 158°F while shellfishes (like lobster, scallops, oysters and shrimp) should be at least 74°C or 165°F. Since it is hard to pierce thermometer, just discard shellfishes that do not open after cooking. Now that you know the internal cooking temperature parameters, you have to know the recommended storage time as well as it is part of ensuring safe consumption of food. The recommended storage time for steaks is three to four days, chops on the other hand should only be stored for three to four days, roasts are three to five days, hotdog is one week and ham is six to seven days. It does not end there because there are still many things that you can do to ensure the safety of food consumed. Never forget to wash hands and sanitize tools and utensils. These activities can help eradicate bacteria thereby reducing the risk of food poisoning and other food-related illnesses.